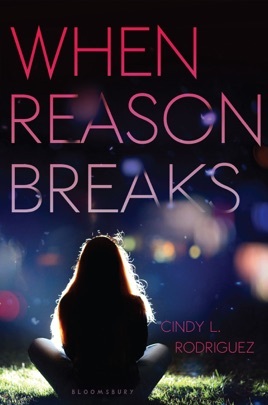 When Reason Breaks is Cindy L. Rodriguez's debut novel and I have to say that I really enjoyed this heartbreaking young adult novel.. Rodriguez's sheds light on a dark topic and the delicacy by which she does is admirable. Weaving in bits of Emily Dickinson's life and poetry while simultaneously telling the story of two troubled teen girls, Rodriguez delivers a good young adult debut. Emily "Elizabeth" Davis and Emily Delgado are both very different from each other. They have different friends and widely different home lives. But both are very emotionally trouble girls. The story begins with one girl attempting suicide and leaving behind a final letter to her teach that tried so hard to save her but was too late. Told in alternating third person point of view, you get to see each girl's inner turmoil through their eyes. Emily is from a very prominent family in town. Her father is an attorney and city councilman. Her life is defined by the pressures that her family and her popular friends put on her. As the story moves forward you begin to see the toll it takes on her as she slips into a very deep depression. Meanwhile, Elizabeth doesn't have the same affluent upbringing that Emily does. Her mom and sister are all she has after her dad left them. Her mom is so focused on keeping the family afloat financially and doesn't take the time to sit down and listen attend to Elizabeth's needs. In English class, their teacher Ms. Diaz starts teaching a unit on Emily Dickinson, pairing the two girls up together on a project. It was hard for me to be fully invested in the book until the latter part of the book. This is very character-driven book, rather than a plot-based book, so I kept that in mind as I read. Nonetheless, even with that reminder, I still felt like the book dragged quite a bit. One thing I really liked was the author had very intricately worked in a lot of Emily Dickinson references and discussed a lot of her poetry in detail. Dickinson's life and morose poetry was mirrored in this book through Emily and Elizabeth's pain. I've never experienced the level of depression these girls went through, but the author really dealt with the subject matter in a respectful way, treating it with care and drawing awareness to it. "Compared to others, her life and her problems were pretty ordinary. So why did it all feel like she was in an epic battle? The great mystery in this book was which girl was the girl who attempted suicide. Obviously, I'm not going to mention it, but I had theories throughout the book. Overall, I liked this book. I would recommend it to those who love "issue books" and enjoy very character-driven types of stories.